The notion popularized by the song "It Never Rains in Southern California" is in fact a myth. It rains alright . . . A LOT. At least this week. Solid. Rain. Every. Day. I know my friends who've been freezing their tails off all winter are enjoying this news. The funnier part is that people in Santa Barbara freak out when it rains and drive like a bunch of idiots. Anyway, I digress . . . . What I wanted to say was when it rains there's a short list of possible prescriptions that seem to soothe the soul in such foul weather. It usually goes something like staying in your pj's all day, reading a book, and taking long naps. At some point you get really hungry though and nothing tastes better than a nice comforting bowl of hot soup. But you can't be bothered with some thin broth. No, you need something substantial, something that sticks to your ribs, something that feels like a blanket of goodness enveloping you. For me that's a phenomenal beef stew. The thing is, there are some pretty lackluster beef stews out there. After some depressing "misses," I am happy to report I've finally uncovered an amazing beef stew recipe. It's an alluring amalgamation of root vegetables, beef chuck, red wine and fresh herbs. And this comes together so easily. You don't even have to brown the meat before adding it to the sauteed onions and fried sage leaves. 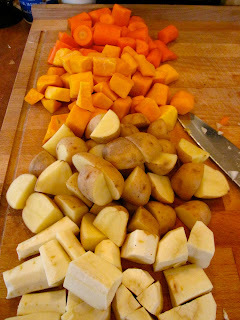 I mean if those aren't the building blocks of a divine stew, I don't know what is. The smell alone is insane but the intense sweet and savory flavor profile will really blow your mind. It's truly the perfect rainy day Rx. But also works great on just a plain old winter day. Preheat oven to 300 degrees. Toss the meat in a bag filled with the flour seasoned with salt and pepper and coat lightly. Heat the olive oil and butter in a large Dutch oven over medium-high heat. Add the onions and sage and fry for 3 to 4 minutes. Then add the meat, vegetables, tomato puree, wine, and stock, and gently stir together. Season generously with pepper and a bit of salt. Bring to a boil and place the lid on top, then cook in the over until the meat is tender. Check at 3 hours but it could be up to 4, depending on the cut of meat. The only way to tell is to mash up a piece of the meat and if it falls apart easily it's ready. Once it's cooked, you can turn the over down to about 225 degrees and just hold it there until you're ready to eat. The secret ingredient behind this dish is to mix in the lemon zest, rosemary and garlic just before serving. Simply stated, it kicks this dish into the next stratosphere. Yield: Serves 4-6.